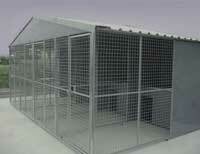 This kennel is for outdoors use and gives you a long lasting, clean and maintenance free kennel. -Hygienic, there are no materials which can absorb smells and harbor any diseases or infections. -Fully mobile should you need to relocate the kennel system in the future. -All our kennels are hot dip galvanised meaning that there is no maintenance needed to keep them in perfect condition.